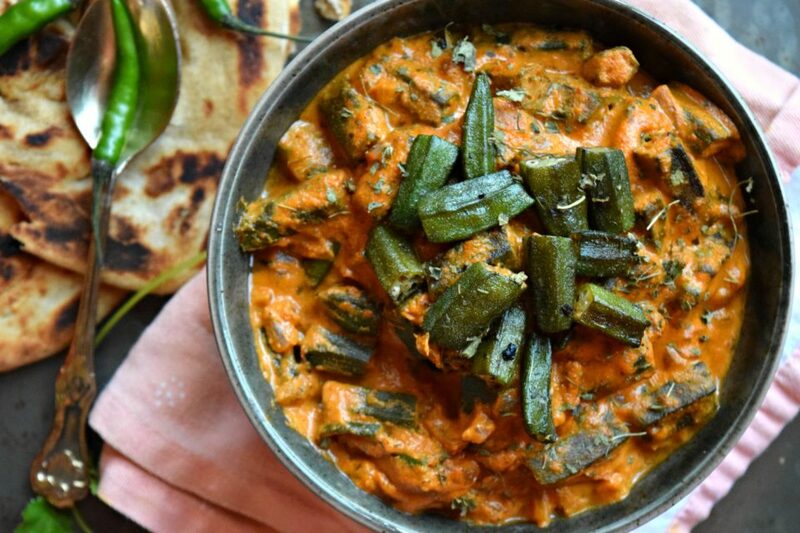 Okra/Bhindi Masala is a restaurant style vegetarian main course dish. The gravy is tomato based, creamy & has a burst of flavors. Serve with roti or rice. Our Food and Nutrition teacher (back in college) used to say this, ‘Eating is a necessity but cooking is an art.’ This statement is so true and every time I cook something, I think of this quote. While most eat to live, there are people like me who not just live eat but cook as well. Cooking is therapeutic for me. being a creative person, I love all forms of art. Be it ingredients or paints, art can be created on a dining plate or a canvas. Poetic right?! Ya, I am in the mood. So indulge me. But yes, you can create different art forms with cooking by playing with different textures, cooking techniques and ingredients. By that logic, you need not always have the same kind of food for lunch and dinner. There are so many ways in which you can cook a regular dish. I get bored with mundane recipes, they don’t excite me anymore. I always have to give it some twist to make it little different to taste and also try to give it a new look. 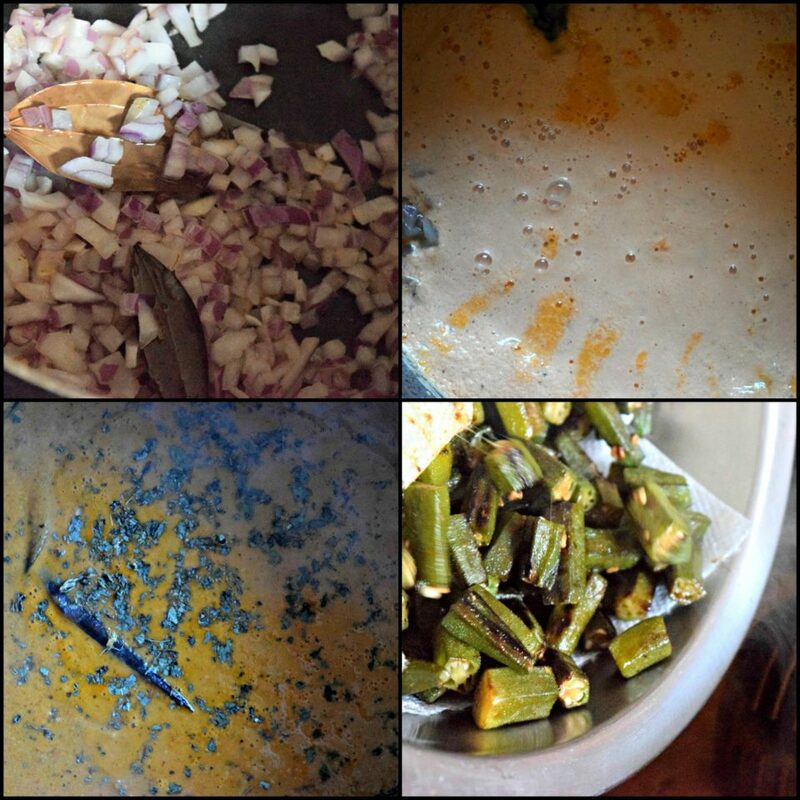 Nearly all my life I have had simple Okra curry cooked in these styles – Spicy Bhindi/Okra or Skillet Fried Okra in Chickpea Flour, Karare bhindi at home. However at an Indian restaurant, I have had Bhindi Masala. It is one of the popular items on the menu and if you haven’t tried it, order it the next you are in an Indian restaurant. 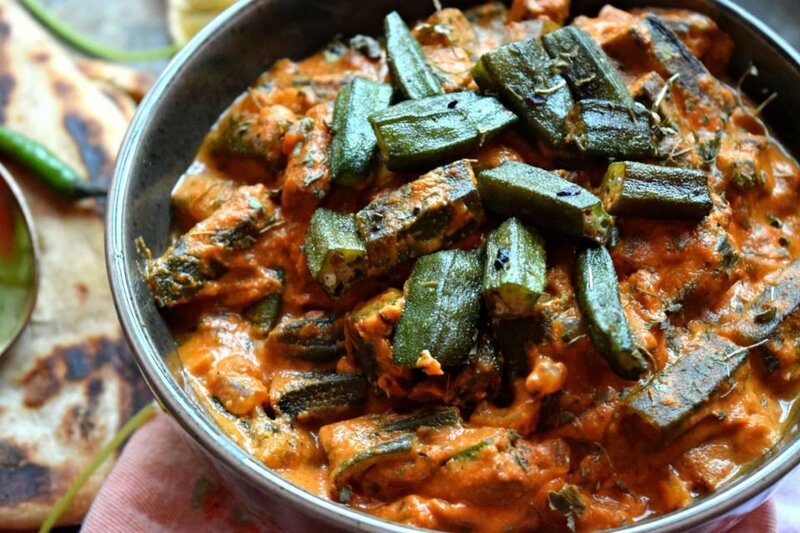 Bhindi/Okra Masala is a creamy, tomato gravy based dish which can be served as main course. to soak the excess oil. and add to it along with garam masala. Lastly add the fried okra to it and mix it lightly. Do not over cook the okra at this stage else it will get mushy. Take it off the flame and serve hot. 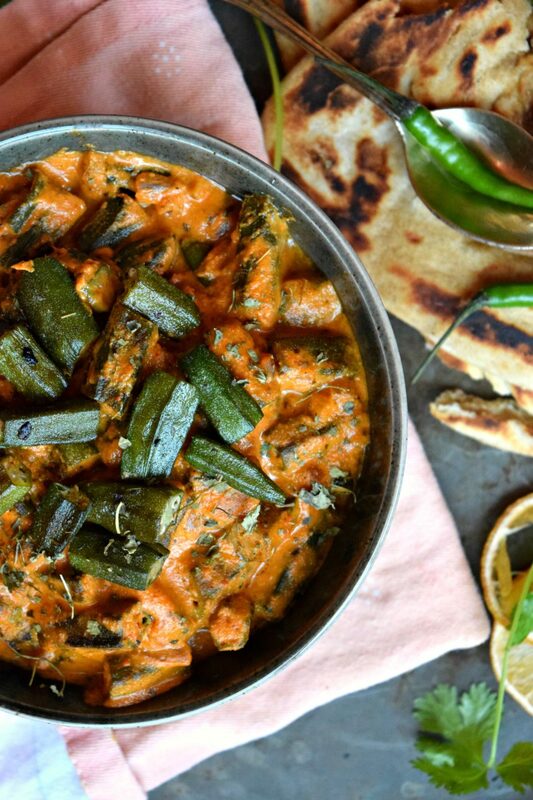 Garnish with cilantro and serve it with any Indian bread or steamed rice. Eating this dish for lunch took me down the memory lane. While I hardly ordered this dish at a restaurant since I had something else in my mind, my mom would always order this. That way I did get to taste it because you know moms! I have tried and created that restaurant style dish today for you which I know you will love. 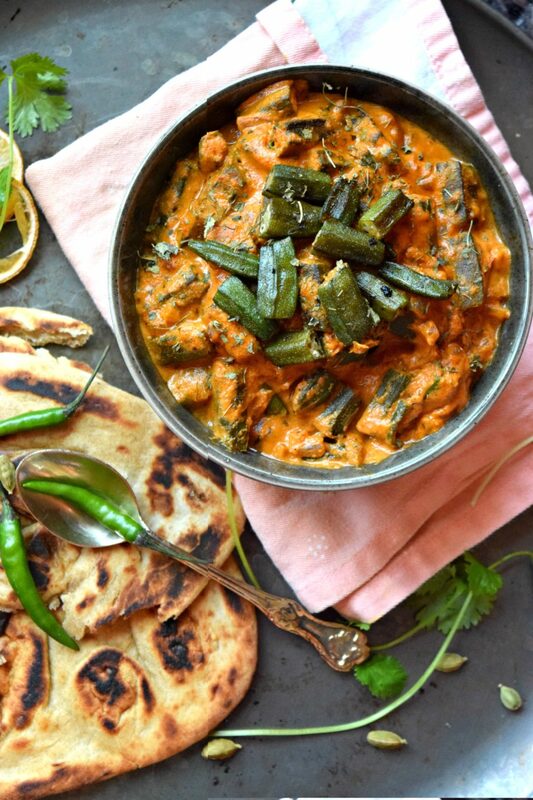 Some other Indian main course dishes that you can try are Simple Potato Fenugreek Curry/Aloo Methi, Chickpea & Black Rice Dumplings in Spinach Sauce Gravy, Veg Kolhapuri Gravy, Paneer Butter Masala, Restaurant Style Vegetable Jalfrezi and Shahi Parwal/Royal Ivy Gourd Curry. 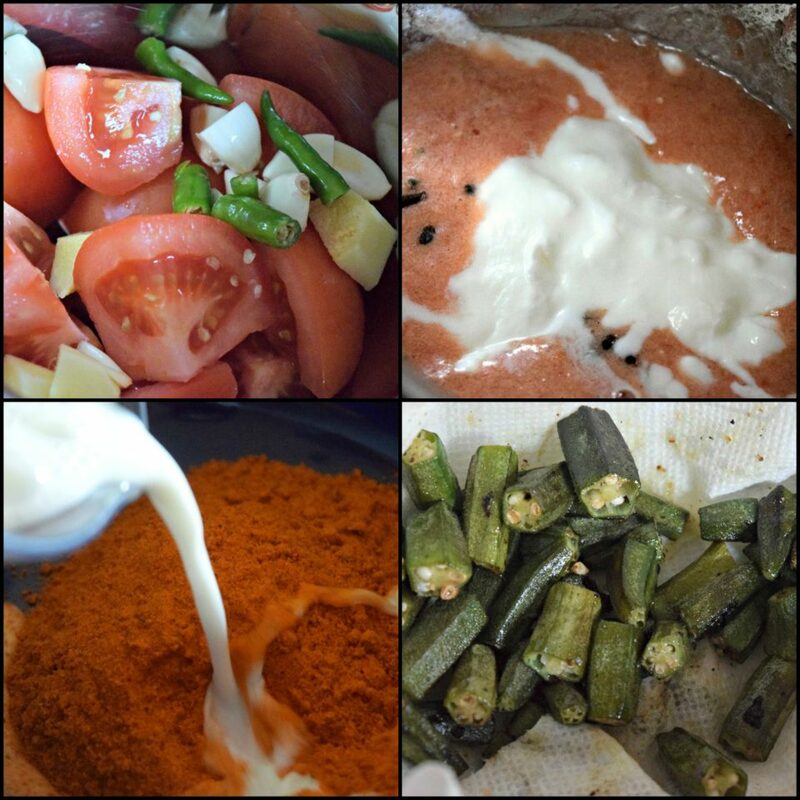 In a mixer grinder, add tomatoes, garlic, ginger and green chillies. Blitz them to a smooth paste. Then add yogurt, cloves, cinnamon and cardamom. Continue to blitz it till the whole spices are ground. Keep this aside for now. In a bowl, add garam masala, chilly powder, dhania jeera powder, kitchen king masala and turmeric powder, add milk to make a thick masala paste. Chop the okra and wash them thoroughly. Pat them dry and fry them in oil. Sprinkle garlic powder and salt while frying. The okra should turn light golden and have a crunch. Strain the oil and place on paper towels to soak the excess oil. In the same pan, in the remaining oil, fry the onions and bay leaf. Once the onions are cooked, add the tomato paste along with salt and fry till the oil begins to leave its sides. Then add the masala paste and continue to fry it for 2 more minutes. Then crush kasoori methi and add to it along with garam masala. Lastly add the fried okra to it and mix it lightly. Do not overcook the okra at this stage else it will get mushy. Take it off the flame and serve hot. 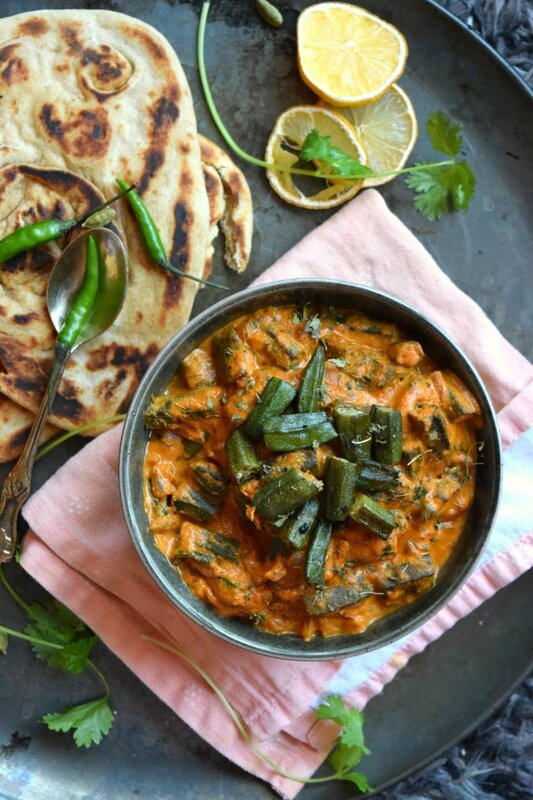 Garnish with cilantro and serve it with any Indian bread or steamed rice.